Parking resources in the Downtown Village are managed for the benefit of customers and business. Nearly 500 convenient parking spaces are provided on-street and in municipal parking lots with prices ranging from $0.50/Hr. to $0.75/Hr. The spaces closest to your favorite destinations are equipped with “silver-top” IPS smart parking meters. These meters provide customers with multiple payment options, including coin, credit & debit cards, and smart phone options for mobile devices, including Apple Pay, Android Pay, and the ParkSmarter mobile app, which allows users to find parking spaces, pay on the go, track time, reload time remotely and even keep track of visits and receipts. Our goal is to make it more convenient for you and enjoy your stay in our downtown. Thanks for visiting and please come often. 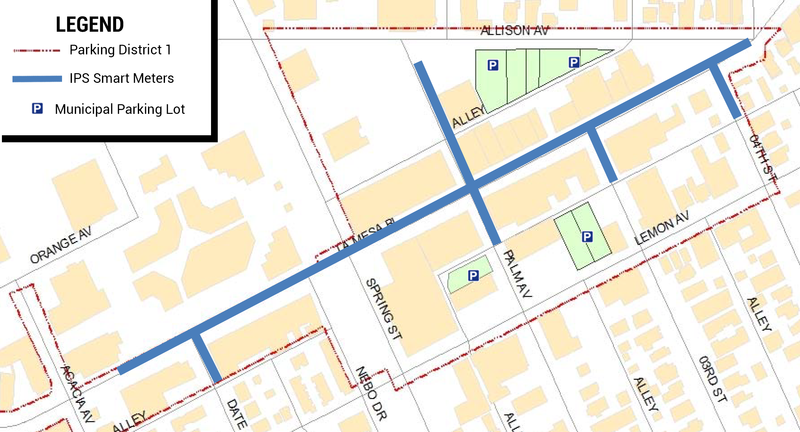 There are several areas in the Downtown Village with silver-top IPS credit card and mobile-pay meters. IPS Meters are not only convenient because they take credit cards, nickels, dimes and quarters but with the more traditional M5 Single Space Meter, you simply pull up, pay and walk away. It’s that simple. Watch this Demonstration Video and see for yourself. San Diego-based IPS Group, Inc. is a design, engineering and manufacturing company focused on low power wireless telecommunications and parking technologies. 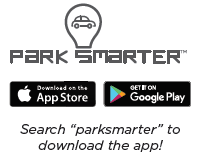 The PARK SMARTER™ mobile app provides our citizen's with a parking experience that saves time and is easy to use. To get started paying through your smartphone, visit the PARK SMARTER™ website and download the application. To contest or pay a parking citation online, CLICK HERE. Copyright ©2018, IPS Group, Inc. All Rights Reserved.